When a Pakistani document is used or is to be used outside Pakistan in any foreign country it requires to be attested from the ministry of foreign affairs Lahore Pakistan. There are some requirements which needs to be fulfilled for the attestation from ministry of foreign affairs Pakistan. The requirement includes that a person himself or his close relative can only get a document attested from ministry of foreign affairs Lahore office or from Ministry of foreign affairs Pakistan. The ministry check the cnic very carefully that a person who came for attestation of document is a close relative or not. However for overseas Pakistani who are out of country and does not have any close relative who can go to ministry of foreign affairs Lahore office or Ministry of foreign affairs Pakistan Islamabad or Karachi can contact Nazia Law Associates as we can get attestation from ministry of foreign affairs Pakistan through legal way. 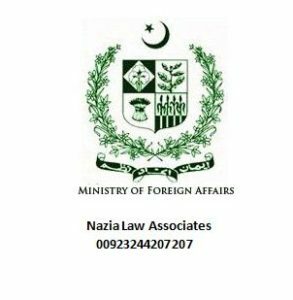 Nazia Law Associates can conduct the MOFA procedure for the clients abroad who are living abroad or are from far cities. However those who are in Pakistan and can easily go to the office of Ministry of foreign affairs Pakistan for MOFA don’t need to contact our law firm in Lahore. Attestation from Ministry of foreign affairs Pakistan is required in all countries because it is the foreign affairs ministry of Pakistan which confirms the originality of a document. Unless a document is attested from foreign affairs no country accepts it. All degrees are required to be first attested from HEC or IBCC then it should be registered by the ministry of foreign affairs.